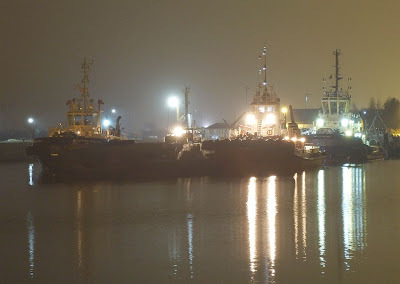 Four tugs lying in the James Watt Dock this evening, three of them 'locals' with a new tug in their midst. On the left is SVITZER MALLAIG, with WARRIOR III berthed astern of her, while KINDEACE, the new tug which arrived on the Clyde during the early hours of today, lies ahead of AYTON CROSS. Owned by J P Knight, KINDEACE was acquired in July, and is more usually found working from her Invergordon base on the Cromarty Firth. She was built in 2005 in Japan, and originally named FUJI MARU. She is fitted with twin azimuth units, like the other tugs shown in this view. I understand that she will be assisting the Clyde fleet for a few weeks. Meanwhile, the tug RED DOLPHIN, has left Rotterdam with a 400-tonne floating crane, GPS ATLAS, to recover the wreck of FLYING PHANTOM. They are due to arrive in around a week's time. Kindeace was built in 1978 and used to be named Ijsland. Appears to be another tug that once was called Kindeace, then Ijsland. I see from JP Knights site the vessel is indeed newer than I first thought. Any more images appreciated John. Can you confirm the name of the salvage crane please as I had been led to believe it is the GPS Atlas. Dougster: This tug replaced the previous one of the same name, which was sold to owners in the United Arab Emirates and renamed ZAHRAA in June 2007. Stewart: My apologies! No idea what i was thinking of when I wrote that! Post corrected now. Robert: Many thanks for your interest over the past few months. A good New Year to you and yours. Just a test to see if I can use a nickname rather than just be anonymous. Good set of photos and a Happy New Year to you.